This is the third recipe on Oh My Veggies that starts with the words “fresh corn.” I thought of a few alternate names after I realized that, but Fresh Corn Soup fits so much better. Because it’s fresh! It’s not a heavy corn chowder. It’s a light soup. Perfect for summer. And it’s made with fresh corn–both the kernels and the cobs. The sweet broth made from simmering the cobs with thyme and water is the secret to the fresh flavor of this soup. And really, fresh is the best part of summer, isn’t it? I’m not a fan of the humidity or mosquitos or sunburn, but I love fresh fruits and vegetables. It’s so exciting to go to the farmers market and be greeted by colorful heirloom tomatoes and strawberries instead of the sea of green that dominates in spring. (Although I like greens too!) And I’ve been loving the fact that I can get (almost) all the fresh herbs I need from the herb garden we put in last month. I used a combination of oregano, dill, lemon thyme, chives, rosemary, and sage in the herbed croutons for this soup, but you can use whatever fresh herbs you have access to. And if you don’t have an herb garden, well, don’t go to the grocery store and buy 6 different packages of fresh herbs! That would be ridiculously expensive. Just use thyme since you’ll be needing to buy that for the broth anyway. 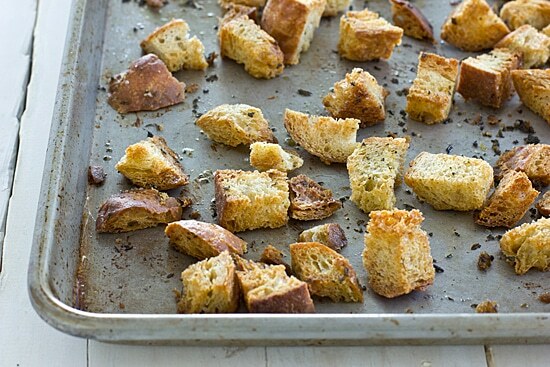 Oftentimes when I’m making a soup recipe that calls for croutons, I skip making them. But I implore you, don’t do that with this recipe! 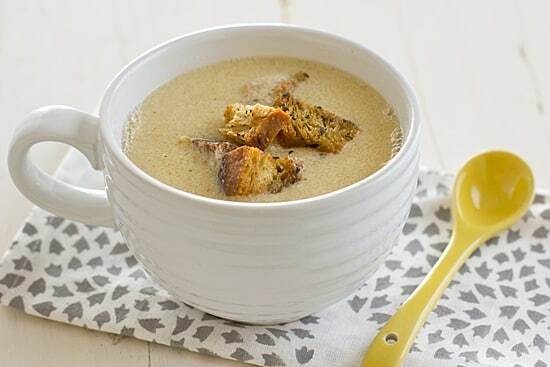 The soup is creamy and delicious without them, but the croutons are the finishing touch that makes all the difference. Between the fresh corn soup and the fresh herbed croutons, this recipe is the best of summer (in a soup bowl). Whisk together olive oil, fresh herbs, salt and pepper in a large bowl. Add cubed bread to bowl and toss to coat. Transfer to rimmed baking sheet and bake for about 30 minutes or until baked through and golden brown. Set aside. Place corn cobs and thyme in a large pot or Dutch oven and cover with water. Bring to a boil, then reduce heat to low. Simmer for 45 minutes. Reserve 3/4 of corn kernels; puree the rest in a blender or food processor until completely smooth. Once broth is finished, remove cobs and thyme sprigs and pour through a fine mesh strainer into a heat-proof bowl. Set aside. Return pot or Dutch oven to medium-high heat. Add olive oil and swirl to coat. Once oil has heated, add reserved corn kernels. Saute 2-3 minutes or until just beginning to brown, stirring occasionally. Reduce heat to medium. Add corn puree and cook 3 minutes more or until thickened, stirring constantly. Add corn broth and simmer 10 minutes. Stir in lemon juice, salt, and pepper. Ladle into bowls and top with a small handful of herbed croutons. If you don’t use all the croutons, store them in an airtight container or zip-top bag and use them within a week or freeze. Oh my, fresh is a good word. It looks so inviting. You can never go wrong with fresh corn, right?! YUM! I think we’re supposed get a cool day or this week so soup could be on the menu! That herb picture is unbelievable… I adore your site, recipes AND your photos…. just gorgeous! Aw, thank you so much! I feel the same way about your blog–I love love LOVE your photos! This looks so good! I love the crouton recipe and the shot of all the herbs lined up. And this soup is so perfect for all the fresh corn we get in the summer. Love it! I have never heard of using the cobs in the broth, that is pure brilliance. Will be doing that for sure. DO IT! The broth is so sweet and it really intensifies the flavor of corn in the soup. So good. I love both of these recipes and the photos are AWESOME! Thanks for sharing. Can’t get enough of fresh corn in the summer — in fact, I have a grilled corn salad for a dinner side. 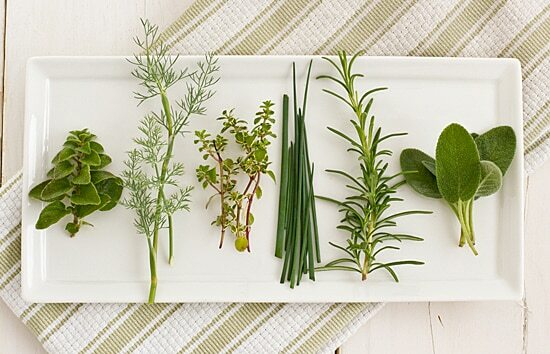 And your plate of herbs is just beautiful, like it should be framed! I’m growing the latter four, and they’re doing well. Love the addition of croutons… I could probably eat those all by themselves. I can’t either! I could really eat it everyday, but my husband is very meh about it–he likes it, but he doesn’t get excited about it like I do. 🙂 I snuck a few croutons while the soup was simmering and I can definitely say that they are good by themselves. I don’t think I’ve ever heard of a warm corn soup – I’m so intrigued, it looks and sounds so good! Haha, well I thought I could picture a chilled corn soup but now that I think of it, maybe I’ve just never heard of corn soup in general! I must be the only one! I’ve made a chilled corn and avocado soup with raw corn that I loved! I tend to prefer cold over hot soups in the summer, but I think a hot soup that used such a seasonal ingredient like corn on the cob would still be amazing. I like that you used the corn in different ways – both the kernels and the puree, and the croutons would make it extra special! I don’t mind hot soups in the summer as long as I’m not eating it on a REALLY hot day. 🙂 Cold soups I’m a little picky about it, but I was really close to making this a chilled corn soup! Well, I have told you my feelings on corn before, but I broke down and used the Florida stuff because I had to try the corn sauteed in coconut milk. Let’s see if I can wait for the local stuff to try this recipe! I think the fresh, local stuff would be ideal for this recipe. Ha! I think the Florida corn is pretty good, but then again, it doesn’t have very far to go to travel to NC. I bet that extra time it takes to go further north makes all the difference! Sometimes I’ll buy corn the day before I need it and in that one day, it gets tough! It’s amazing the sweet milky goodness that’s still left on the cobs after you remove the kernels, isn’t it? It makes for such great soups. And this one looks awesome! This was the first time I’ve tried it (and my husband was definitely skeptical when he saw the cobs simmering away on the stove! ), but I’m definitely going to do it again. Maybe I’ll freeze some to use when corn’s not in season anymore! I cannot wait to buy some fresh corn and make this soup. Perfect for summer 🙂 Yum! 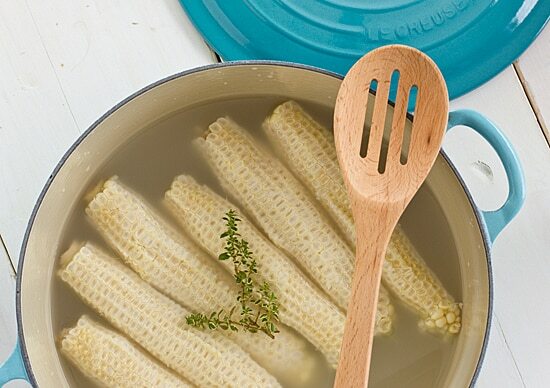 Excited to try boiling corn cobs with thyme and water…Wonderful idea. Thanks for the recipe. yum, love the herbed croutons too. Yumm! I love corn soup! Ooh yum! I’ve never had corn soup but my husband adores corn chowder! Corn just screams of the fresh flavors of summer! This was delicious and so easy. And MAN, good call on the croutons. WAY easier to make than I ever expected, so delicious, and with the soup they created a new flavor experience in my mouth. Yes, this definitely isn’t a chowder-y corn soup! 🙂 If you like it a little chunkier, some diced red peppers might be a good addition too. I’m glad you enjoyed it!